Modification and Enforcement of orders for child custody, child support, post-separation support or alimony are quite common. Life following divorce is likely to be filled with transition. Because courts recognize the likelihood of change following the entry of such final orders systems are in place for modifying orders and, when necessary, enforcing orders previously entered. Orders for equitable distribution are typically not modified later, but instead stand as a final division of assets and debts. Likewise, agreements regarding the division of assets and debts which are set forth in Separation and Property Settlement Agreements are typically not modifiable by the Court. Both parties can have the assurance that the agreement fully and completely resolved their equitable distribution issues and these matters will not be further adjusted or addressed by the Court. Provisions regarding spousal support in Separation and Property Settlement Agreements can also be non-modifiable by the Court if the parties expressly state their desire in the Agreement that the Court not modify that issue. Child Custody orders can also be modified upon a showing of a substantial change in circumstances affecting the welfare of the child/ren. Such changes can include: the increased age of the children, a relocation by either parent, remarriage, the children’s wishes, changes in the children’s academic performance or mental health, or an event or circumstance that has occurred which has drastically changed the workability of the prior child custody arrangement. If you are experiencing significant change in circumstances following the entry of your child custody, child support, or alimony order, acquiring the advice and guidance of an experienced family law attorney is an important and prudent protective step. Likewise if you have an agreement in which the child custody provisions or child support provisions are no longer workable or appropriate and a modification is needed or desired, Barri Payne is a Board Certified Specialist in Family Law who has the experience and expertise to guide you through all the considerations and options you may have. Even in the most thoroughly considered and negotiated divorces, and even when the spouses have agreed to the terms and have the best of intentions in that process, it is an unfortunate reality that sometimes people have to be forced to comply with orders regarding property settlement, support, and other obligations required of a court order or agreement. When one party is repetitively recalcitrant or non-compliant, creating frustration and turmoil, the Courts in North Carolina will take necessary steps to ensure their orders are followed and enforced. 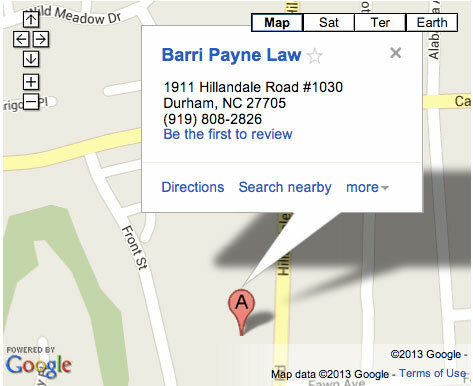 Barri Payne is an experienced family law attorney. She understands how frustrating it can be for clients to have to rehash the emotional issues of their divorce that almost always rise to the surface when compliance has to be forced. Barri is a tough and thorough advocate in these matters. She can discuss with you the possibility of filing motions for contempt or for specific performance of your Agreement. Set an appointment to find out how she can help ensure compliance with your final order or separation and property settlement agreement. How do Courts Determine Child Custody?